JOHN Arnold Fleming, O.B.E., F.R.S.E., J.P., was a well known and very wealthy Helensburgh man who died at his home, Locksley, East Abercromby Street, on October 22 1966, less than a month before his 95th birthday. He was a noted journalist, author, artist, traveller, politician, businessman, churchman and benefactor. The elder son and last remaining member of the family of Sir James Fleming, of Woodburn, Rutherglen, he attended Albany Academy before specialising in modeling at Glasgow School of Art, of which he later became a governor. Then he studied science at Edinburgh University. He was associated with his father for many years in pottery businesses in Scotland and Staffordshire, and was for many years honorary secretary of the Earthenware Manufacturers of Scotland. He assisted in the formation of the Pottery Industrial Council, and was chairman of his own electrical company. In 1923 he published ‘Scottish Pottery’, which was accepted as the standard work on this subject. This was followed by ‘Scottish and Jacobite Glass’ 1938. A prolific writer of articles, letters and books, he completed his last book “Mary Guise” when he was 89. He was a lifelong friend of TV inventor John Logie Baird. He donated the bronze bust and plinth of Logie Baird which stood for many years in Hermitage Park before being moved to the West Clyde Street seafront, but missed the 1961 ceremony when the bust was unveiled by Miss Annie Baird because of an accident in his home. He also endowed the John Logie Baird Memorial Prize at Hermitage School, now Academy. He said: “John Logie Baird was the greatest man I ever knew. The man was a genius. We took to each other, and here in Locksley we would have long discussions when he would pour out his thoughts and plans to me. "I wanted so much to help him, but he was a very proud and withdrawn man, and it was difficult to know how to help him without him taking offence. Fleming was a painstaking historian. His ‘Flemish Influence in Britain’, published in 1930, traced the history of the Flemings from the settlers from Flanders in the Middle Ages through Sir Robert Fleming, who was present at the slaying of "The Red Comyn" at Dumfries before Bannockburn; through to the time of Mary Queen of Scots and the principal of her "Maries”, Mary Fleming, and down to recent times. For this book he received a leter of congratulations from Paul Hymans, president of the League of Nations, and then a notice from Baron de Cartier, the Belgian Ambassador in London, that "by Royal Decree H.M. The King of Belgium was graciously pleased to bestow upon J.A.Fleming the decoration of Commander of the Order of Leopold II in recognition of your contribution towards a better understanding between Great Britain and Belgium." He also wrote another book about the surname of Fleming, and recently these two books have been reprinted as CD books in Australia, with the proceeds going to the publication of hardcopy books, and for the production of other CD books made for genealogy of antique rare books that need preserving. “I am sure he would approve and I hope he is smiling from the balconies of heaven,” says Janet Fleming-Flemming in Australia. She contributes to the Fleming Family Website, a repository for all things Flemish. He wrote a book on Helensburgh in 1957, entitled 'Helensburgh and the Three Lochs', but, typically of his retiring nature, did not include his name as the author. It was an echo of an earlier anonymous book, actually by Town Clerk George MacLachlan, in 1894. Both were published by Macneur & Bryden Ltd., the East Princes Street newsagents, stationers, printers, and publishers of the weekly Helensburgh and Gareloch Times. Macneur & Bryden also published a booklet by him which told the story of the Gareloch as Military Port No.1 in World War Two. Another of his interests was politics. A Liberal of the old school, he contested the St Rollox constituency in Glasgow, where the family pottery works was, in the 1922 General Election. He lost, but five years later he became a member of Helensburgh Town Council and for a time represented the burgh on Dunbartonshire County Council. He was appointed a Bailie, and around this time donated a chime of bells for the town clock and endowed a fund for its upkeep. He was a prominent member of Helensburgh Bowling Club — the High Green — which was just across the road from his home. One day he had walked into the clubhouse, asked to see the secretary, and handed over the very substantial donation. 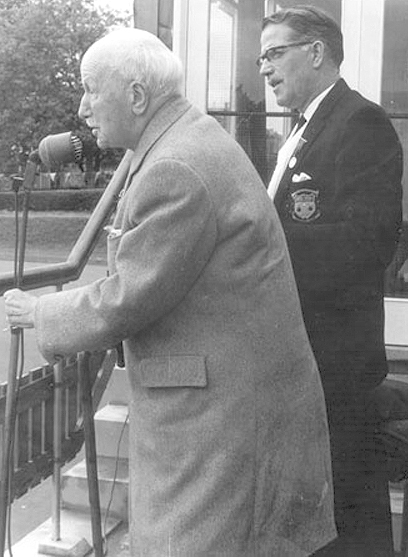 He is pictured (right) at the opening of the new clubhouse on Saturday August 21 1965 with then club president Richard Don. Another insight into his life can be found on the Arrochar, Tarbet and Ardlui Heritage website. Giving her memories of the Home Guard, Frances Gillies writes: “Sphagnum moss had been used as a wound dressing during the First World War and some enthusiastic members of the Red Cross seemed to assume that it would be used again in the Second. “One day we were told to open the schoolhouse gates as some important visitors were coming to afternoon tea — but when the car came in and we shut the gates to keep out the sheep we were to disappear and on no account come into the house till the visitors were gone. “When the car did appear it was a rather swanky one and driven by a chauffeur in uniform. Out climbed a tall lady and a little man — Mr and Mrs J.Arnold Fleming from Helensburgh. I am almost certain she was something in the Red Cross. "The chauffeur unloaded several large wicker laundry baskets and after they had all taken tea and left for home it transpired that we were expected to fill the baskets with sphagnum moss. 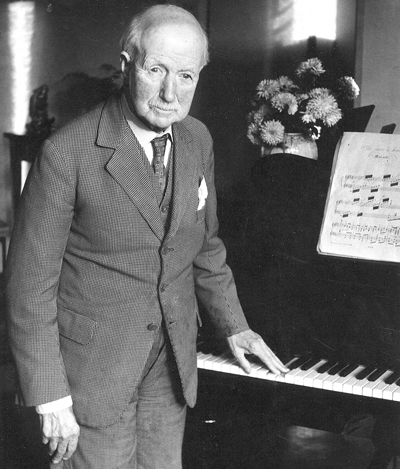 He was at various times hon vice-president and a past president of the Royal Glasgow Institute of Fine Arts, a Fellow of the Royal Society of Edinburgh, a Fellow of the Chemical Society of London, chairman of the Royal Scottish Academy of Music, and hon vice-president of the Scottish Artists Benevolent Association. He was a member of Unesco and British representative at the Ceramic Museum of Faenza, Italy. Locally he was an elder and officebearer of St Bride’s Church and honorary president of Helensburgh and District Horticultural Society. Another hobby was falconry, and his ‘Falconry, the Sport of Kings’, published by Country Life, contains a full glossary of technical terms, many of which have found their way into modern English usage. He married in 1914 Wilhelmina Reid, daughter of William Brand, of Glasgow. There were no children of the marriage, and she died several years before he did.